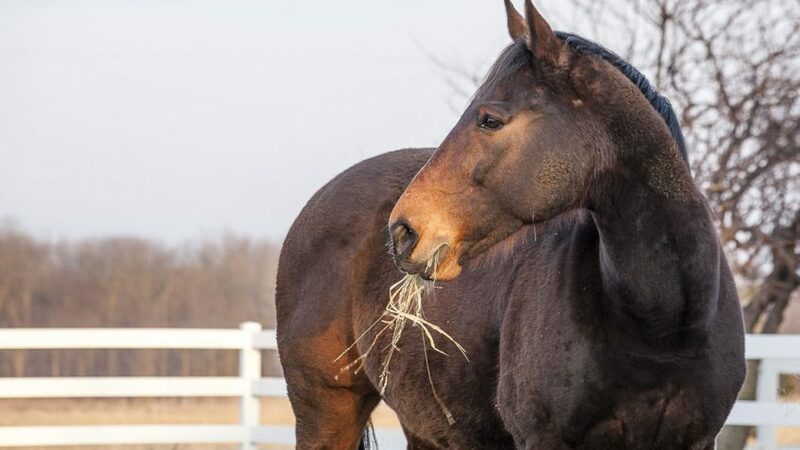 A study from Anthony Blikslager and Megan Burke outlines advances in diagnosing and effectively treating acute equine colic and post-operative ileus. A look at some of the newest published studies coming out of the NC State College of Veterinary Medicine. A study from Anthony Blikslager and Megan Burke outlines advances in diagnosing and effectively treating acute equine colic and post-operative ileus. Published in Veterinary Clinics: Equine Practice, the research highlights several important findings, including the importance of differentiating between surgical and medical lesions early in acute colic treatment; how to help maximize survival through differentiation of viable and nonviable intestine during colic surgery; and how systemic inflammatory response syndrome plays a central role in post-colic surgery. 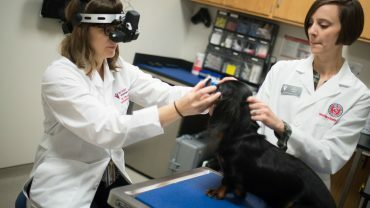 A group of CVM researchers are working to find an effective treatment for SARDS— a leading cause of irreversible blindness in dogs. 2. Sudden acquired retinal degeneration syndrome, or SARDS, is a leading cause of irreversible blindness in dogs. A group of CVM researchers are working to find an effective treatment. A pilot study published in Veterinary Ophthalmology found that treating SARDS with the immunosuppressive medication mycophenolate mofetil as a sole agent has no positive effect on physical health, vision and retinal structure, and that further studies are needed to test other treatment options. Co-authors on the study include Freya Mowat, Katharine Lunn, Melanie Foster, Annie Oh, Jonathan Williams and Whitney Young. 3. It is now more vital than ever to address the complexities of food safety issues using a One Health approach to medicine, according to a new work co-authored by Sid Thakur. In the American Society for Microbiology’s journal, Microbiology Spectrum, Thakur elaborates on how the One Health philosophy — the interdependence of human, animal and animal health — is the comprehensive approach needed to tackle an array of global health issues, including transmission of infectious diseases, antimicrobial resistance surveillance and productive farming. 4. A new way to predict body mass in immature humans may provide more accurate information for an array of archaeological, forensic and paleontological findings. The research, co-authored by Christopher Walker and published in Physical Anthropology, outlines two new equations using immature human samples that may be more effective in creating body mass predictions among new non-adult human findings. There are presently few published methods to create such predictions. David Ley is a co-author of a study showing that an “imperfect immunity” to a pathogen in a common bird makes the pathogen stronger for the next victims. 5. David Ley is a co-author of a study showing that an “imperfect immunity” to a pathogen in a common bird makes the pathogen stronger for the next victims. The work, published in Science, studied house finches that contracted mycoplasmal conjunctivitis, similar to “pink eye,” and notes a link between bird immunity and pathogen virulence. 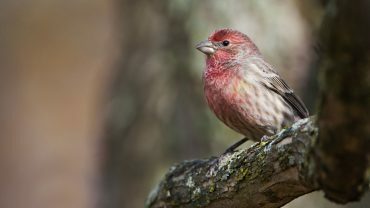 The study also found that pathogen strains dominating a population with the incomplete immunity were about twice as harmful compared to groups with no immunity, suggesting that incomplete immunity is likely driving harmful strain evolution among finches. 6. The gastroprotectant sucralfate shows potential to effectively treat and prevent stress-related mucosal diseases, or SRMDs, in dogs. The research, co-authored by Anthony Blikslager and Duncan Lascelles and published in the Journal of Veterinary Internal Medicine, found that sucralfate appeared effective at resorting gastric barrier function defects induced by acid, as well as accelerated tissue repair. The loss of gastric mucosal barrier defenses often occur during critical illness in both humans and canines. 7. Co-authors Eli Cohen and Christine L. Gremillion investigated radiographic findings and clinical factors in dogs with colonic torsion in research published in Veterinary Radiology & Ultrasound. The study reviewed 10 years of canine cases with confirmed or presumed diagnosis of the life-threatening condition, which has not been previously well described. Such torsion can lead to sepsis, circulatory shock and death, and quick identification is vital to launch surgical intervention. Greg Lewbart led a team performing physical exams and health assessments of 32 tortoises in a study published in Conservation Physiology. 8. 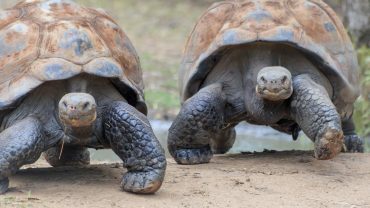 Two of the world’s most unique — and vulnerable — animals get a close-up in new research papers co-authored by Greg Lewbart based on field work in the Galápagos Islands. As art of a planned reintroduction of Galápagos tortoises into the highlands of San Cristóbal in the Galápagos archipelago, Lewbart led a team performing physical exams and health assessments of 32 tortoises in a study published in Conservation Physiology. The team measured weights and conducted blood biochemical and hematological analyses, among other objectives, providing baseline health ranges to aid future conservation of the species. Co-authors on the tortoise study included John Griffioen, Alison Savo, Sarah Roberts, George Schaaf and Michael Levy. 9. The second research project, published in Frontiers in Marine Science, features radiographic imaging of marine iguanas as a case study for incorporating the diagnostic tool in study threatened species in remote locations. Lewbart and his team, including co-author Eli Cohen, used portable radiographic equipment to capture the first digital internal images of living marine iguanas, iconic Galápagos natives. Through the radiographs, researchers were able to record a slew of anatomic information and showcase the viability of researchers in a remote location using the technique to examine live animals. 10. A study of osteochondrosis in broiler chickens found that there is no relationship between the severity of the disease and the type of strain impacting the animal. The work, published in Avian Pathology, took a close look at the disease, which inhibits normal bone development in growing animals. It noted no significant difference in the impact of older and newer versions of strains. Co-authors include Luke Borst, John Barnes, M. Mitsu Suyemoto and Laura Chen.